Only 43 miles from Paris, an easy 40-minute train ride from the Gare de Lyon, it is a wonder, even on a glorious weekday morning in September, that I can project myself back through the centuries at my leisure without being propelled from room to room on a sea of tourists. With 500,000 visitors a year, as opposed to Versailles’s 7.5 million, despite its nearness to Paris and stature as one of the most splendid palaces in the whole of France, the Château de Fontainebleau can almost be called an undiscovered gem. There are no barricades or intrusive signage to anchor you in the 21st century – and no meandering lines of impatient visitors. 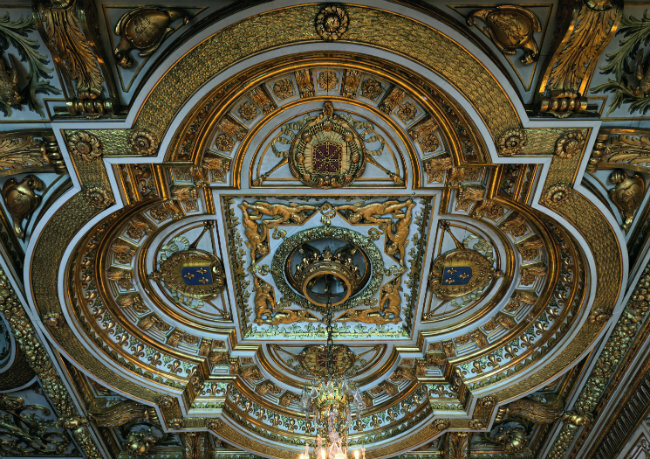 Within ten minutes of my arrival I’m free to wander the palace’s intoxicatingly beautiful rooms, one or two of which, for a few moments, I have entirely to myself. Comparison with Versailles is inevitable. 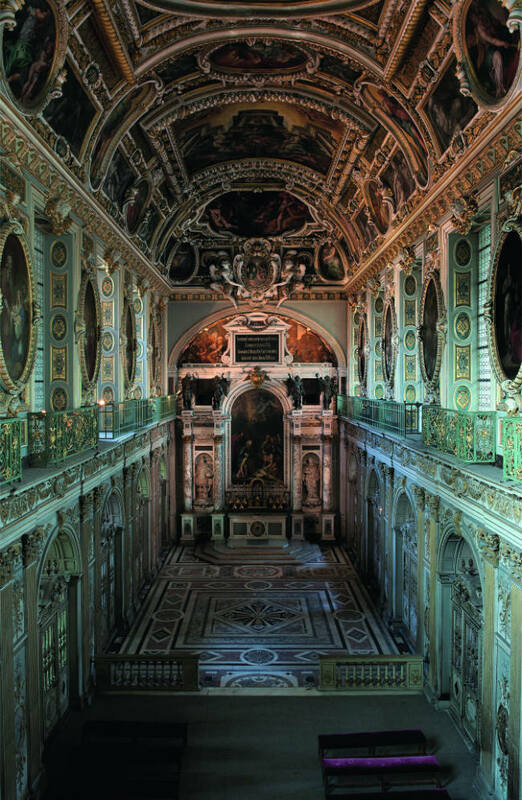 But beyond their being two immense palaces, each brimming with royal treasure, the similarities between Versailles and Fontainebleau aren’t nearly as interesting as the contrasts. 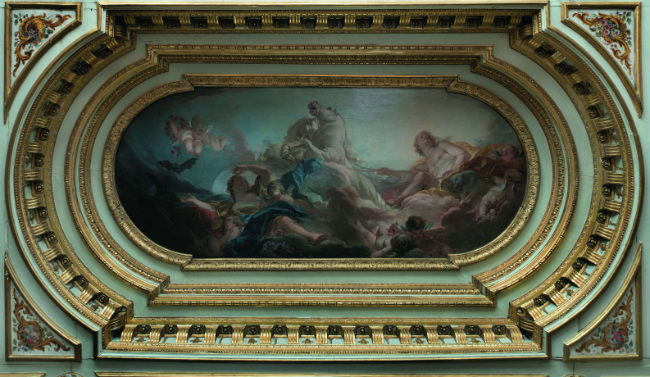 As the expression of a single monarch who wielded almost maniacal control over his architects, Versailles speaks of the vast wealth, power and influence of one king. As the dwelling of an unbroken line of French sovereigns – 34 kings and two emperors, to be exact – Fontainebleau is the surprisingly harmonious expression of eight centuries of royal life; a palace that has been lovingly maintained, embellished and enriched by each successive ruler. While Versailles was perpetually under construction – throughout Louis XIV’s long reign and driving the palace’s denizens half mad with the dust, noise and lack of privacy – Fontainebleau was where the royals retired to relax, to hunt and play, to bear their children (Louis XIV’s first child was born here, as were many kings), and to preserve or regain their health. Consequently, history buffs and art lovers are especially fond of the castle for its remarkable layering of periods and styles. Though not exactly cosy, Fontainebleau’s grandeur is on a human scale, and its rooms still convey something of the character of the inhabitants and their epoch that inspires curiosity and draws visitors in. And certain rooms, especially Marie Antoinette’s Turkish boudoir (which can be seen only on a guided tour), convey a touching intimacy, where royals, for whom a private life was one of the few luxuries not afforded, could find time alone or in select company. Through two tiny windows in the stairwell, the queen, or her ladies, could peer unseen into the grand Louis XIII Salon or François I Salon downstairs before deciding whether or not to make an appearance. Charmed by the room, Joséphine adopted it for herself, restoring the gilded boiserie, brocades and rosy silks. 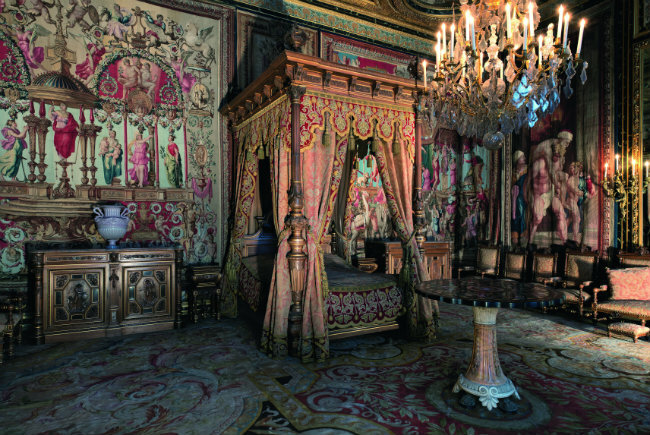 More touching still is Marie Antoinette’s sublime official bedroom – lovelier than the one at Versailles – which required so much work that it remained unfinished at the time of her arrest. Though it was originally built in 1137 as a royal residence and hunting lodge, of which only the medieval castle keep remains, the “Fontainebleau style” began in 1528 with François I, who built what is now the central core of the château, ushering in the Renaissance style in France. The king had a connoisseur’s appreciation for Italian painting and patronised the greatest artists of the day to decorate his rooms. Leonardo da Vinci, a friend and guest of the king, came to Fontainebleau with his Mona Lisa in tow, which he bequeathed to François I upon his death. 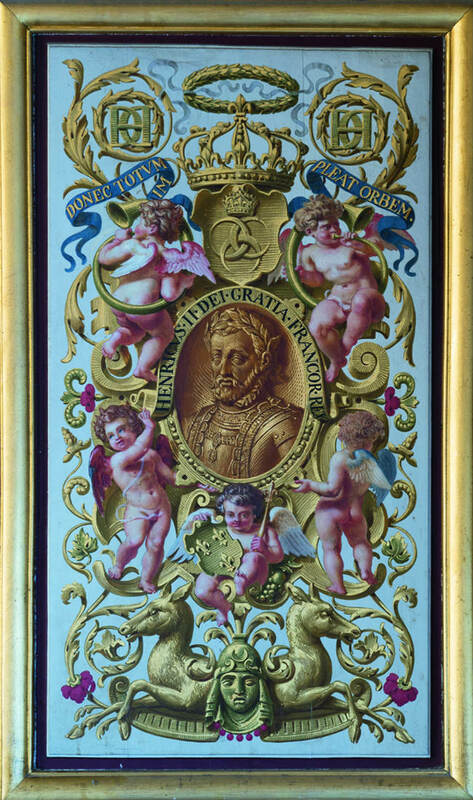 The portrait hung in François’s royal bathroom, along with works by Raphael and Michelangelo, where he entertained visitors to show off his treasures. 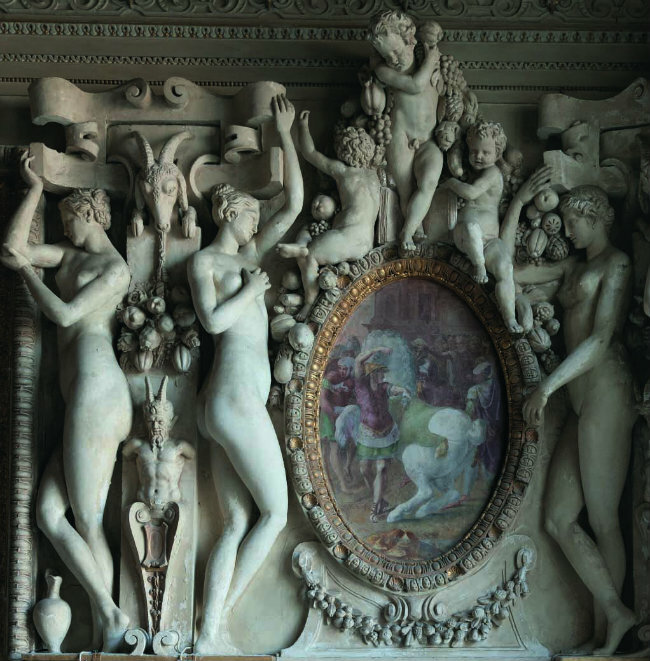 For his Great Gallery, one of the château’s masterpieces, François I commissioned French architects and Italian painters, sculptors and woodcarvers to work side by side to create an exquisitely detailed hall of carved and gilded woodwork interspersed with stucco reliefs, sculptures and colourfully sensuous figures in allegorical frescoes. Smaller and infinitely more approachable than Versailles’s Galerie des Glaces, it is a place of delight, where visitors can spend time enjoying the charming scenes in full daylight. But gauge your time wisely, since there are so many splendid rooms to see here: the Grands Appartements, where the royals lived and received, the Throne Room, the Galeries de Diane and des Cerfs, the royal chapel, and the Napoleon wing and its fascinating museum, the Papal Apartment, and many others. Like every other château in France, Fontainebleau’s contents were either burned, auctioned off or sent to the Louvre for safekeeping during the Revolution. 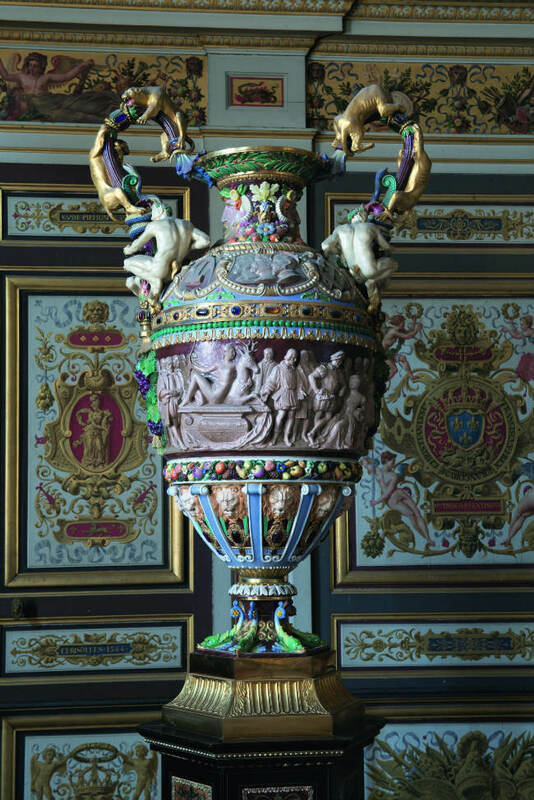 Napoleon alone had the power to scour every source in Paris to recover its treasures, or similar pieces, to refurnish the Papal Apartment in time to receive Pope Pius VII and his retinue for Napoleon’s coronation. 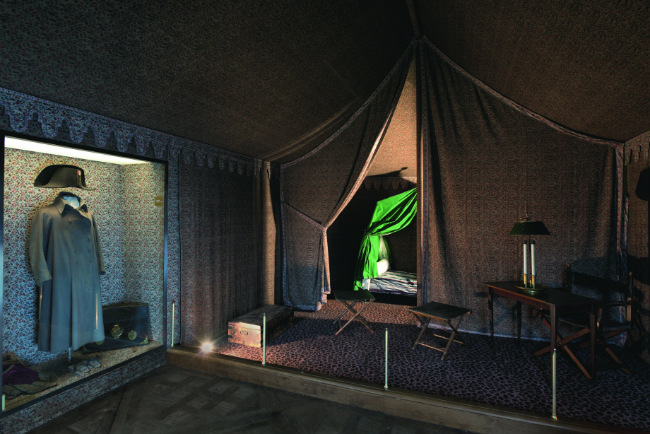 The rooms were restored to their regal splendour in a mere three weeks. (Later, after a falling out, the apartment would become the pope’s prison for 18 months.) Napoleon also commissioned scores of new pieces that blended his favoured classical Empire style with the more delicately refined 17th- and 18th-century French styles. 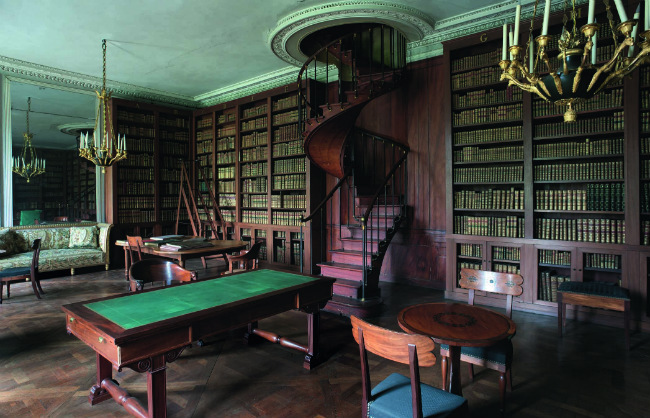 It is thanks to Napoleon, who gave his famous farewell speech on the grand entrance stairs, that the Fontainebleau we see today is more completely and opulently furnished than any château in France, the equal of Versailles. 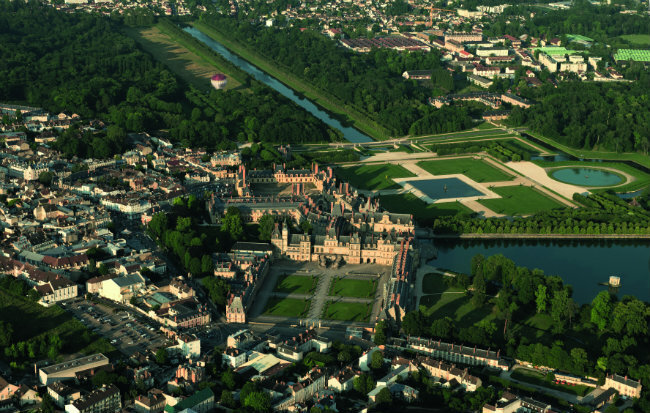 Of Fontainebleau’s 1,500 rooms, only about 250 are open to the public, and some of those can only be seen on one of the château’s tours. 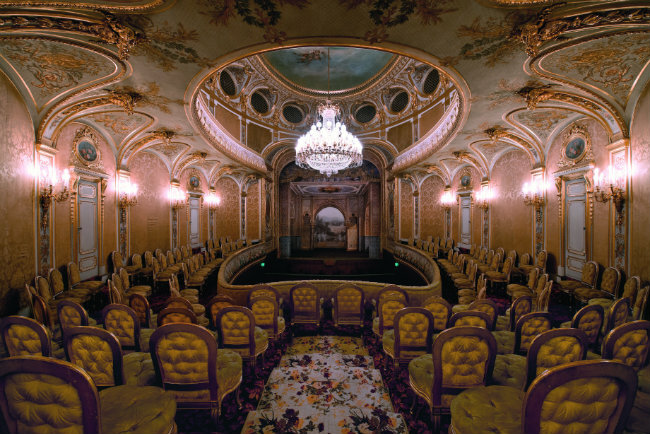 If you have time, take one of these tours, as they include the private apartments of Madame de Maintenon’s (second, secret wife of Louis XIV) rooms, and the glorious Imperial Theatre, reopened and restored after decades of obscurity. 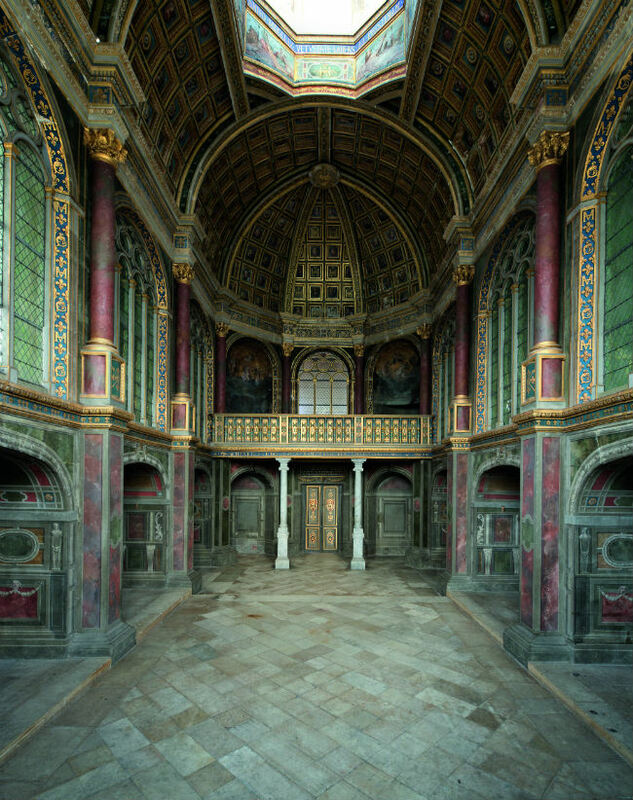 Commissioned by Napoleon III, fewer than 15 performances were staged here in the 1860s before it was closed up and forgotten. Although the theatre was briefly used in the 1920s by an American school, and then by the Nazis during the Occupation, its “rediscovery” was a revelation: the brilliant yellow silk upholstery intact but mellowed to a lovely Venetian gold and its sumptuous lighting and gilding perfectly preserved. It is now in its second stage of restoration and will have its grand opening next year. 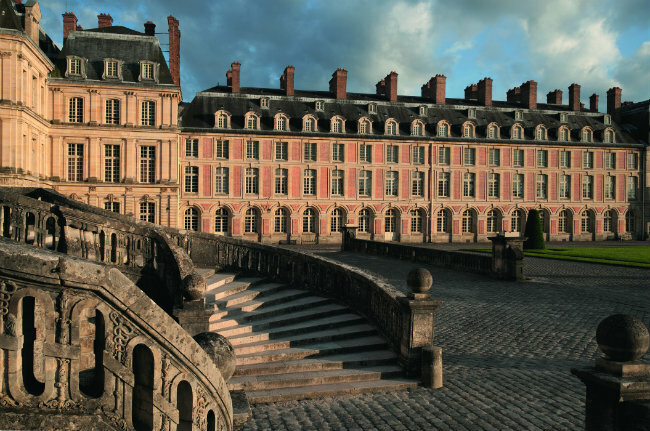 The tours of Fontainebleau are mostly in French, though there are some in English. Advance booking is not required, but it is still a good idea, especially in summer (see the events listings on the château’s website). 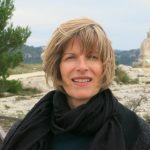 An audioguide, available in several languages, is an excellent introduction to the château’s incredibly rich and textured history. 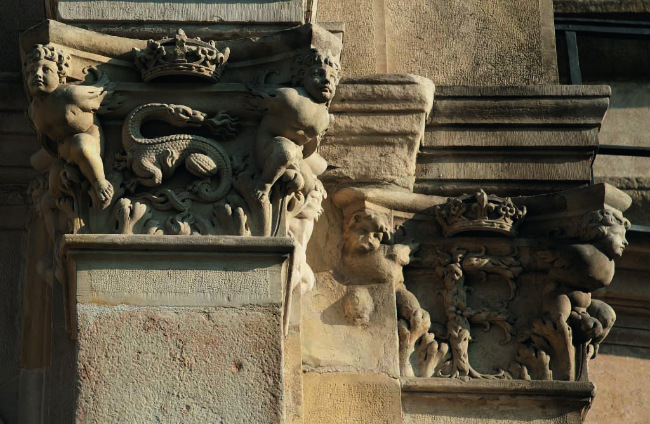 Fontainebleau houses four museums, of which Empress Eugénie’s Chinese Museum is the most awe-inspiring, containing as it does many of the objects from the British and French looting of the Summer Palace in Beijing in 1860, along with 19th-century gifts from the Ambassador of Siam. 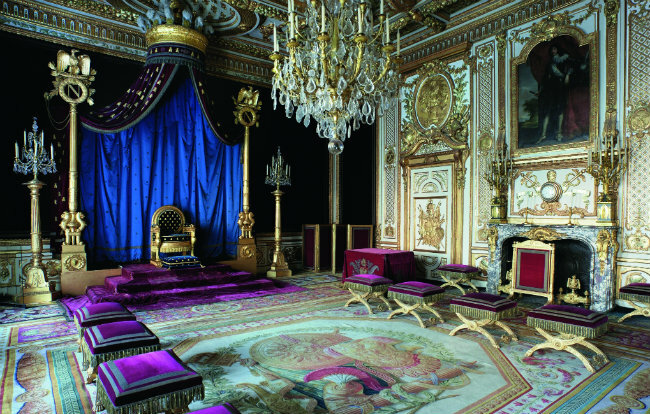 There is also the Napoleon I Museum, with diamond-studded ceremonial swords and crowns, iconic portraits – including François Gérard’s famous portrait of Joséphine in her coronation robes – imperial sets of Sèvres porcelain and a reconstructed luxury tent of the kind used in Napoleon’s Egyptian campaign. Finally, the Paintings Collection and Furniture Collection include priceless pieces from the Louvre. 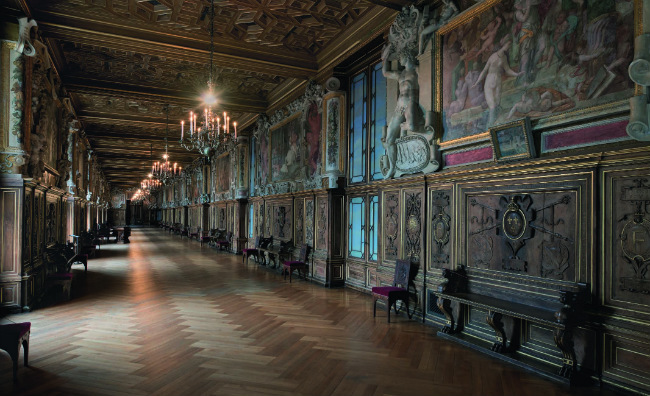 And every year the château mounts a world-class temporary exhibition in the splendid Salle de Bal. Reserve at least a day for your visit to Fontainebleau to see the château and gardens and have time for lunch in town, just outside the château gates. But there’s so much more to see and do here that it would make the perfect weekend getaway. Stroll through the palace gardens: the Grand Parterre, the largest formal gardens in Europe, designed by André Le Nôtre and Louis Le Vau – architects of Versailles’s gardens, among others; the English Garden and the Garden of Diane. You can also hire a boat to float among the swans on the Carp Lake, where Louis XIV loved to feed the fish, and take a mini train or horse-drawn carriage ride.The Forest of Fontainebleau is legendarily beautiful and crossed with trails – an absolute favourite of cyclists and hikers.